Cystic fibrosis (CF) lung disease is characterized by infection with Pseudomonas aeruginosa and a sustained accumulation of neutrophils. In this study, we analyzed 1) the expression of MyD88-dependent TLRs on circulating and airway neutrophils in P. aeruginosa-infected CF patients, P. aeruginosa-infected non-CF bronchiectasis patients, and noninfected healthy control subjects and 2) studied the regulation of TLR expression and functionality on neutrophils in vitro. TLR2, TLR4, TLR5, and TLR9 expression was increased on airway neutrophils compared with circulating neutrophils in CF and bronchiectasis patients. On airway neutrophils, TLR5 was the only TLR that was significantly higher expressed in CF patients compared with bronchiectasis patients and healthy controls. Studies using confocal microscopy and flow cytometry revealed that TLR5 was stored intracellularly in neutrophils and was mobilized to the cell surface in a protein synthesis-independent manner through protein kinase C activation or after stimulation with TLR ligands and cytokines characteristic of the CF airway microenvironment. The most potent stimulator of TLR5 expression was the bacterial lipoprotein Pam3CSK4. Ab-blocking experiments revealed that the effect of Pam3CSK4 was mediated through cooperation of TLR1 and TLR2 signaling. TLR5 activation enhanced the phagocytic capacity and the respiratory burst activity of neutrophils, which was mediated, at least partially, via a stimulation of IL-8 production and CXCR1 signaling. This study demonstrates a novel mechanism of TLR regulation in neutrophils and suggests a critical role for TLR5 in neutrophil-P. aeruginosa interactions in CF lung disease. The airways of cystic fibrosis (CF)3 patients are frequently infected with bacterial pathogens, especially Pseudomonas aeruginosa (1, 2), which determines morbidity and mortality in these patients (3). As a consequence of the airway infection, proinflammatory cytokines and chemokines are produced that attract large numbers of neutrophils into CF airways (4, 5). Neutrophils represent the first and most potent line of cellular host defense and are considered as the key innate immune cells in CF lung disease (3, 6). The immune system recognizes pathogens via TLRs. Ten different human and 12 murine TLRs have been identified so far (7). Neutrophils express all human TLRs described except for TLR3 (8, 9). Activation of TLRs by their respective ligands stimulates neutrophil function, suggesting that TLR activation shapes effector neutrophil responses at sites of infection (8, 9). Studies using transformed (10) or primary airway epithelial cells (11) have provided evidence that TLR2 and TLR5 (12) may represent the main TLRs involved in the recognition of P. aeruginosa. Animal studies have further demonstrated that MyD88 (a central adaptor protein for most TLRs)-dependent pathways play an essential role in the pulmonary host defense against P. aeruginosa (13, 14, 15, 16). Mice deficient in MyD88 fail to control bacterial replication after infection with P. aeruginosa (15). Skerrett et al. (16) showed that TLR2 and TLR4 are involved in the cytokine response to P. aeruginosa infection, but seemed to play no role in the clearance of P. aeruginosa infection. A recent animal study corroborated the involvement of TLR5 in host defense against P. aeruginosa by showing that intact flagellin/TLR5 signaling was a prerequisite for an efficient clearance of acute P. aeruginosa infection (17). Based on these previous findings and the well-known importance of neutrophils in antibacterial host defense, we hypothesized that MyD88-dependent TLRs, in particular TLR2, TLR4, and/or TLR5, are essential for neutrophil-pathogen interactions in P. aeruginosa infection. Therefore, we analyzed TLR expression levels on circulating and airway neutrophils in the setting of pulmonary P. aeruginosa infection in CF and bronchiectasis patients. Our results indicate that specifically TLR5 surface expression is up-regulated on airway neutrophils in CF and, to a lesser extent, bronchiectasis patients and correlates with lung function in these patients. Further studies demonstrated that TLR5 is stored intracellularly in neutrophils and is up-regulated in a protein synthesis-independent manner through cooperation of TLR1 and TLR2 signaling. 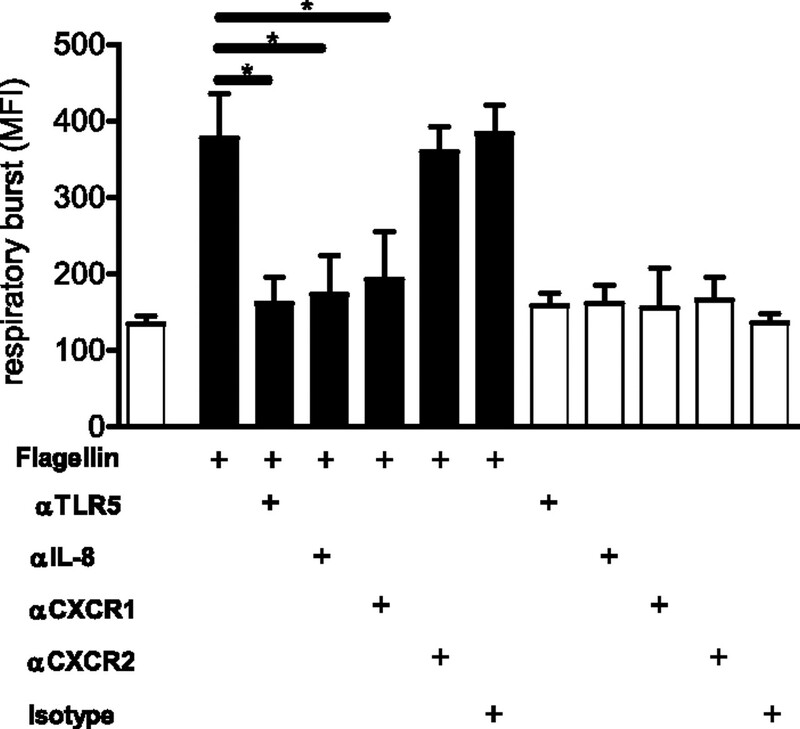 Functional analyses showed that TLR5 activation by flagellin enhances the IL-8 production, the phagocytic capacity, and the IL-8/CXCR1-mediated respiratory burst activity of neutrophils. Collectively, these findings point to a critical role for TLR5 in neutrophil-P. aeruginosa interactions in CF lung disease. Thirty-five CF patients, 11 non-CF bronchiectasis patients, and 13 healthy controls were selected for the study (Table I⇓). The CF patients included 18 male and 17 female patients with a mean (SD) age of 23 ± 8 years. Inclusion criteria were the diagnosis of CF (by clinical symptoms and positive sweat tests or disease-inducing mutations), forced expiratory volume in 1 s (FEV1) > 20% of predicted value, and being on stable concomitant therapy at least 2 wk before the study. Exclusion criteria were history of lung transplantation, any lung surgery within the previous 2 years, being on any thoracic surgery waiting list, severe concomitant disease, severe liver cirrhosis with ascites, active pulmonary exacerbation within the 4 wk before the study, current smoker, pregnancy, or lactation. In nine CF patients, bronchoalveolar lavage (BAL) was performed. In all CF patients, sputum induction was performed as described below in detail. Twenty-one CF patients were ΔF508 homozygous and 14 were ΔF508 heterozygous. None of the CF patients received corticosteroids or macrolides or had signs of severe systemic infection within 2 mo prior to the study. Twenty-one CF patients inhaled recombinant human DNase and 25 patients inhaled bronchodilators. The non-CF bronchiectasis patients included six male and five female patients, with a mean (SD) age of 57 ± 13 years. Inclusion criteria were bronchiectasis based on a history consistent with the disease and a computed high-resolution chest tomographic scan or bronchogram showing pathological changes consistent with bronchiectasis. None of the bronchiectasis patients was heterozygous or homozygous for 80 known CF mutations or had hereditary deficiency of α1-antitrypsin. In all bronchiectasis patients, BAL and sputum induction were performed. The control subjects were six healthy male and four healthy female adults (mean (SD) age, 22 ± 7 years) without pulmonary diseases or any systemic disease, age-matched to the CF group. All control subjects were nonsmokers. In four healthy control subjects. BAL was performed and in all healthy controls sputum induction was performed. The study was approved by the institutional review board of the Children’s Hospital (Ludwig-Maximilians University, Munich, Germany) and was performed according to the most recent version of the Declaration of Helsinki. Written informed consent was obtained from all patients and healthy control subjects before enrolment. In 26 of the 30 CF patients and 3 of the 9 non-CF bronchiectasis patients chronically infected with P. aeruginosa, nonflagellated P. aeruginosa bacteria were detected, as assessed by light microscopy and a motility assay(18). DTT was obtained from Calbiochem. Pefabloc was purchased from Merck. Induced sputum was obtained by inhalation of 5.8% hypertonic saline for 15 min, incubated with an equal volume of 6.5 mM DTT for 20 min at 37°C, and finally filtered through Nitex gauze filters (BD Biosciences). The sputum suspension was centrifuged at 4°C, 500 × g for 10 min, and the supernatant was centrifuged at 4°C, 4000 × g for 20 min. Bronchoscopy and BAL (4 × 1 ml of 0.9% NaCl/kg body weight) were performed as described previously (19). The first fraction of BAL fluid (BALF) was used because it contains the highest percentage of neutrophils. After centrifugation at 200 × g for 10 min, the cell-free sputum or BALF supernatant was stored at −80 °C until analysis. Sputum or BALF cells were resuspended in HBSS supplemented with PMSF (Calbiochem), BSA (Sigma-Aldrich), and NaN3 to avoid in vitro proteolysis. Cytospin slides were prepared with 200,000 cells/slide and at least 400 cells were differentiated by May-Grünwald-Giemsa staining. BALF supernatant from five CF patients was pooled and used for in vitro cell stimulation studies. Freshly obtained cells from peripheral blood, BALF, or induced sputum were incubated with Abs for 40 min, washed two times, and analyzed by flow cytometry (FACSCalibur; BD Biosciences). The following labeled monoclonal anti-human Abs were obtained from eBioscience: mouse IgG1 TLR1-PE, mouse IgG2a TLR2-FITC, mouse IgG1 TLR4-PE, and rat IgG2a TLR9-PE. Mouse IgG2a TLR5-PE was purchased from Imgenex. The following labeled monoclonal anti-human Abs were obtained from BD Pharmingen: CD45 mouse IgG1-allophycocyanin, mouse IgG1-allophycocyanin, mouse IgG1-PE, mouse IgG2a-PE, mouse IgG2a-FITC, and rat IgG2a-PE. Gating of neutrophils was based on light scatter properties and positive expression for CD45. Before the study, the identification of airway neutrophils and the discrimination between neutrophils and alveolar macrophages were optimized as described previously (20, 21). Ten thousand neutrophils per sample were analyzed. Propidium iodide (PI, 5 μg/ml; Sigma-Aldrich) and annexin V-FITC (5 μg/ml; Boehringer Mannheim) were used to discriminate viable (annexin V−, PI−) from apoptotic (annexin V+, PI−) and necrotic (annexin V+, PI+) leukocytes. Only viable leukocytes (annexin V−, PI−) were included in the analysis. Treatment of blood with DTT had no significant effect on TLR1, TLR2, TLR4, TLR5, or TLR9 expression on neutrophils (data not shown). For intracellular staining, the IntraPrep intracellular staining kit (Beckman Coulter) was used according to the manufacturer’s instructions. In brief, isolated cells were fixed with formaldehyde (4%), followed by permeabilization with saponin, Fc blocking, and staining of intracellular receptors. Intracellular expression was calculated as total expression (mean fluorescence intensity (MFI)) minus surface expression (MFI). The isotype controls were subtracted from the respective specific Ab expressions and the results are reported as MFI. Calculations were performed with CellQuest analysis software (BD Biosciences). Neutrophils were freshly isolated from peripheral blood. Venous blood was drawn and neutrophils were isolated immediately by density gradient centrifugation over isotonic Percoll according to the manufacturer’s instructions. Percoll (δ = 1.078 g/ml) was purchased from Amersham Biosciences. After lysis of the erythrocytes, the neutrophils were harvested, washed twice with HBSS (Life Technologies-Invitrogen) and 0.1% BSA, and resuspended in HBSS at a cell concentration of 106/ml. The purity of the neutrophil suspensions was ≥98%, as assessed by microscopic examination of Pappenheim cytospin preparations. Cell viability was confirmed by trypan blue dye exclusion (≥95%). PMA, fMLP, ionomycin from Streptomyces conglobatus, and cycloheximide (CHX) were obtained from Sigma-Aldrich. Recombinant human IL-8 (72 aa), IFN-γ, G-CSF, GM-CSF, and TNF-α were purchased from PeproTech. Recombinant P. aeruginosa flagellin was obtained from Inotek Laboratories (22). Lipoteichoic acid (LTA) from Bacillus subtilis, nonmethylated CpG oligonucleotides type A (5′-ggGGGACGATCGTCgggggg-3′), the synthetic bacterial lipoprotein Pam3CysSerLys4 (Pam3CSK4), and LPS from P. aeruginosa (P. aeruginosa serotype 10) were obtained from InvivoGen. A neutralizing anti-human IL-8 Ab was from BD Biosciences. CXCR1- and CXCR2-blocking Abs were from R&D Systems. The effect of PMA (10−7 M)/ionomycin (10−5 M), fMLP (1 μM), LTA (1–100 μg/ml; TLR2), P. aeruginosa LPS (100 ng/ml; TLR4), CpG (100 μg/ml; TLR9), Pam3CSK4 (10 μg/ml; TLR1/2), P. aeruginosa flagellin (1 μg/ml; TLR5), recombinant human IL-8 (72 aa, 50 ng/ml), recombinant human G-CSF (100 ng/ml), recombinant human GM-CSF (100 ng/ml), recombinant human IFN-γ (1000 U/ml), or recombinant human TNF-α (50 ng/ml) was assessed on TLR2, TLR4, and TLR5 surface expression on neutrophils. These doses of these agents were chosen based on experiments prior to the study showing maximal activation of human neutrophils without affecting cell viability. In addition, the effect of BALF pooled from five CF patients (see above) on TLR2, TLR4 or TLR5 surface expression was examined. CFTR function in neutrophils was inhibited by the highly specific CFTR inhibitor GlyH-101 (5 μg/ml), which has been described to block CFTR-mediated chloride transport (Calbiochem) (23). Where indicated, blocking mouse anti-human TLR1, TLR2, TLR5, and TLR6 and respective isotype control Abs (all from InvivoGen) were used to inhibit TLR signaling as described previously (24). Peripheral blood-isolated neutrophils (5 × 106) were stimulated in RPMI 1640 medium for the indicated time points at 37°C/5% CO2. After the incubation period, neutrophils were washed twice with ice-cold PBS, incubated with Abs for 40 min, washed two times with PBS, and analyzed by flow cytometry as described above. Where indicated, the effect of 120 min of pretreatment (4°C) with CHX (5 μg/ml) on TLR5 receptor induction was analyzed. Levels of IL-8 and TNF-α were analyzed in duplicates by a sandwich ELISA according to the manufacturer’s instructions (R&D Systems). Peripheral blood- or BALF-isolated neutrophils were washed twice, resuspended in 100 μl of HBSS, and fixed in an equal volume of 4% (w/v) paraformaldehyde for 30 min. Where indicated, neutrophils were permeabilized with an equal volume of cold 0.05% Triton X-100 for 2 min on ice. After washing and resuspending in 100 μl of HBSS, the neutrophils were incubated with rabbit anti-human TLR5 or rabbit IgG isotype control Abs. After staining with anti-rabbit Alexa Fluor 555 along with Con A conjugated to Alexa Fluor 488, confocal laser-scanning microscopy was performed with the Leica TCS NT laser system on a Leica DM IRB microscope. Anti-rabbit Alexa Fluor 555 was from Invitrogen. Con A conjugated to Alexa Fluor 488 was from Molecular Probes. Cross-talk between the green and red channel was avoided by use of sequential scanning. Luminosity analysis was performed with SigmaScan Pro software. P. aeruginosa bacteria were incubated with the fluorescent ligand lucifer yellow (LY) for 60 min at room temperature. Neutrophils were incubated at equal numbers for 2 h at 37°C with LY-stained preopsonized P. aeruginosa bacteria (2 × 107/ml). The resulting mixtures were agitated gently for 20 min and neutrophils were separated from the free bacteria by three centrifugations at 200 × g for 5 min. The LY fluorescence of the isolated neutrophils was analyzed by flow cytometry. Dihydrorhodamine 123 was from Molecular Probes. The respiratory burst of neutrophils was analyzed by measuring the rhodamine-1,2,3 fluorescence intensity by flow cytometry as published previously (25). Comparisons among all groups were performed with ANOVA and comparisons between two patient groups were performed with the two-sided t test. Correlation analysis was performed by calculating the two-tailed Pearson correlation coefficient (26). Statistical analysis was performed with Prism 4.0 (GraphPad software). We analyzed the protein expression levels of the major antibacterial TLRs on airway and circulating neutrophils in two disease conditions characterized by P. aeruginosa infection, CF and bronchiectasis, and compared them to noninfected healthy control subjects. TLR1 expression on neutrophils did not differ between peripheral blood and airway fluids and was equally expressed in CF patients, bronchiectasis patients, and healthy controls (Fig. 1⇓A). TLR2 on circulating neutrophils was significantly decreased in CF patients compared with healthy controls and bronchiectasis patients. Although TLR2 expression was higher on airway than on blood neutrophils in CF and bronchiectasis patients, TLR2 expression levels on airway neutrophils did not differ among CF, bronchiectasis, and control subjects. Similar to TLR2, TLR4 expression was higher on airway than on circulating neutrophils in CF and control subjects, but again TLR4 expression levels did not differ significantly among airway neutrophils from CF, bronchiectasis, and healthy control subjects. These findings indicate that TLR2 and TLR4 are up-regulated on airway neutrophils vs circulating cells without a significant difference among CF, bronchiectasis, and healthy control airways. TLR expression of neutrophils in the airways and peripheral blood of healthy controls and CF or bronchiectasis patients. A, TLR expression. TLR1, TLR2, TLR4, TLR5, and TLR9 expression of neutrophils was quantified in peripheral blood (white circles), induced sputum (light gray circles), and BALF (dark gray circles) from healthy control subjects (Controls), CF patients, and non-CF bronchiectasis patients (BE). For TLR1, TLR2, TLR4, and TLR5, surface expression levels are shown. For TLR9, intracellular expression levels are shown. Groups were compared by ANOVA and Student’s t test. MFI (specific Ab staining minus isotype staining). Horizontal bars represent means. a, p < 0.05 induced sputum/BALF vs peripheral blood. B, Airway:blood expression ratio. The MFI units of TLR expression on airway (induced sputum) neutrophils were divided by the MFI of TLR expression on peripheral blood neutrophils, resulting in an airway:blood expression ratio. Groups were compared by ANOVA and Student’s t test. Bars represent means ± SD. C, Histograms. Representative histograms of TLR5 surface expression in airway (induced sputum) neutrophils in healthy controls, CF patients, and bronchiectasis patients. MFI (specific Ab staining minus isotype staining). The green line represents the isotype controls, the blue-filled curve the specific Ab staining. D, TLR5 surface expression and lung function in CF patients. TLR5 surface expression on induced sputum neutrophils and FEV1 (percentage of predicted) of CF patients. Correlation analysis was performed by calculating the two-tailed Pearson correlation test. Asterisks indicate patients with flagellated P. aeruginosa in their airways. E, TLR5 surface expression and lung function in bronchiectasis patients. TLR5 surface expression on induced sputum neutrophils and FEV1 (percentage of predicted) of bronchiectasis patients. Correlation analysis was performed by calculating the two-tailed Pearson correlation test. Asterisks indicate patients with flagellated P. aeruginosa in their airways. F, Longitudinal TLR5 surface expression and lung function. TLR5 surface expression levels on airway (sputum) neutrophils (left panel) and lung function values (right panel) from three individual CF patients (patient #1, age 16 years; patient #2, age 18 years; and patient #3, age 31 years) were analyzed longitudinally at four different time points, each time point separated from the other one by an interval of 9–13 mo. All three patients had flagellated P. aeruginosa. G, TLR5 surface expression and flagellated bacteria in CF patients. TLR5 surface expression on induced sputum neutrophils from CF patients with flagellated (n = 7) and nonflagellated (n = 28) P. aeruginosa bacteria in their airways. H, Lung function in relation to TLR5 expression and flagellated bacteria. Lung function (FEV1; percentage of predicted) is shown for CF and bronchiectasis patients stratified for low (<100 MFI) or high (>100 MFI) TLR5 surface expression levels on airway (induced sputum) neutrophils and for the presence of flagellated P. aeruginosa bacteria in their airways. I, Intracellular TLR5 expression. Neutrophils from CF patients were isolated from peripheral blood (CF Blood) or BALF (CF Airways). Isolated neutrophils were permeabilized with Triton X-100 (0.05% at 4°C) and were then stained with rabbit anti-TLR5 Abs, anti-rabbit-Ig Alexa Fluor 555, and Con A conjugated to Alexa Fluor 488. Permeabilized neutrophils were used to visualize TLR5 distribution between surface and intracellular sites. Confocal laser-scanning microscopy was performed with the Leica TCS NT laser system, including a Leica DM IRB microscope. Red represents TLR5 receptors and green Con A (membrane staining). TLR5 expression on airway neutrophils was strongly increased in CF patients compared with both healthy control subjects and bronchiectasis patients. The increased TLR5 expression was consistently present on both sputum- and BAL-derived airway neutrophils. TLR5 expression levels on peripheral blood neutrophils did not differ among the groups, indicating that the increase of TLR5 on airway neutrophils represents a lung-specific phenomenon. TLR5 expression on airway neutrophils was also increased in bronchiectasis patients compared with healthy controls, albeit to a lesser extent as observed in CF patients. Intracellular TLR9 expression was increased in airway neutrophils compared with circulating neutrophils in all three patient groups, but expression levels in airway neutrophils did not differ significantly among the patient groups. Calculating airway:blood ratios of TLR expression, that is expression on airway neutrophils divided through the expression on circulating neutrophils, revealed ratios ∼1–1.5 for TLR1, TLR2, and TLR4 without significant differences among CF, bronchiectasis, and control subjects (Fig. 1⇑B). For TLR5, a ratio of 1.3 was found in controls, whereas a significantly increased ratio of ∼2.7 was found for CF and ∼1.8 for bronchiectasis patients. For TLR9, the airway:blood ratio was generally increased to 2.3–2.7 without differences among the patient groups. Thus, only TLR5 expression showed a specifically higher airway:blood ratio in CF patients compared with healthy controls and bronchiectasis patients. Fig. 1⇑C depicts representative histograms of TLR5 expression on airway neutrophils in healthy control, bronchiectasis, and CF subjects, illustrating the marked increase of TLR5 surface expression on CF airway neutrophils. These studies demonstrate that among the antibacterial TLRs expressed by human neutrophils, specifically TLR5 is up-regulated on infiltrated CF airway neutrophils. TLR5 surface expression levels on airway neutrophils showed a positive correlation with FEV1 in CF (Fig. 1⇑D) and, to a lesser extent, in bronchiectasis (Fig. 1⇑E) patients, whereas no correlation was found for TLR5 expression on circulating neutrophils or for TLR1, TLR2, TLR4, or TLR9 expression levels on peripheral blood or airway neutrophils (data not shown). In a longitudinal substudy of three individual CF patients, TLR5 surface expression levels on airway neutrophils were also associated with lung function values (Fig. 1⇑F). Patients with flagellated bacteria had higher TLR5 surface expression levels on airway neutrophils than patients with nonflagellated bacteria (Fig. 1⇑G). Interestingly, patients with both a high TLR5 surface expression on airway neutrophils and flagellated P. aeruginosa bacteria detected in their airways had better lung function values than patients with a high TLR5 expression or flagellated P. aeruginosa bacteria only (Fig. 1⇑H). Using confocal microscopy, we confirmed our flow cytometric finding of up-regulated TLR5 expression in CF airway neutrophils and further found that TLR5 was expressed intracellularly in both peripheral blood and airway neutrophils (Fig. 1⇑I). Next, we investigated which components in CF airway secretions might up-regulate TLR5 surface expression on airway neutrophils. Therefore, we stimulated peripheral blood-isolated neutrophils with several proteins which are abundantly found in CF airway fluids (27), in particular several proinflammatory cytokines and bacterial TLR ligands. To analyze the cumulative effect of the CF airway microenvironment on TLR5 expression, we treated isolated neutrophils with pooled CF airway fluids (BALF). These studies demonstrated that CF BALF and the TLR1/2 ligand Pam3CSK4 strongly up-regulated TLR5 surface expression, while a weaker effect was found for PMA/ionomycin, fMLP, TNF-α, IL-8, G-CSF, IFN-γ, and LTA (Fig. 2⇓A). CFTR inhibition had no effect on TLR5 surface expression at baseline or at PMA- or Pam3CSK4-induced TLR5 up-regulation (Fig. 2⇓A and data not shown). Since Pam3CSK4 is considered as a TLR1/TLR2 ligand and TLR2 is well known to heterodimerize with TLR1 and TLR6 (28, 29), we applied specific anti-human TLR1-, TLR2-, and TLR6-blocking Abs to assess by which distinct TLR(s) the effect of Pam3CSK4 on TLR5 up-regulation is mediated. Blocking of TLR2 on neutrophils before stimulation with Pam3CSK4 strongly decreased TLR5 up-regulation, while blocking of TLR6 had no effect and blocking TLR1 had a slight but not statistically significant effect (Fig. 2⇓B). Blocking of both TLR1 and TLR2 had a stronger effect than blocking TLR2 alone, whereas simultaneous blocking of TLR2 and TLR6 had no additional effect. Using an isotype control Ab instead of blocking Abs or the blocking Abs alone without Pam3CSK4 stimulation had no effect on TLR5 expression. To evaluate whether this TLR1/TLR2-mediated up-regulation of TLR5 expression was also relevant for the in vivo situation in CF patients, we treated isolated neutrophils with pooled CF BALF and blocked TLR1, TLR2, and/or TLR6 before BALF exposure (Fig. 2⇓C). Similar to the results obtained with Pam3CSK4, the CF BALF-induced up-regulation of TLR5 expression was substantially reduced when TLR2 was blocked and was almost completely prevented when both TLR1 and TLR2 were inhibited. Further analysis showed that the Pam3CSK4-elicited induction of TLR5 surface expression was already maximally appreciated after 10 min of incubation time (Fig. 2⇓D). Prolonging the incubation time through 6 h did not increase the expression of TLR5 any further (data not shown). Pretreatment of neutrophils with CHX had no influence on the up-regulation of TLR5 surface expression. Confocal microscopy confirmed the redistribution of intracellular TLR5 receptors to the cell surface upon cell activation (Fig. 2⇓E). When viewed in combination, these studies indicate that 1) activation of TLR1/TLR2 signaling up-regulates TLR5 surface expression on neutrophils and that 2) the up-regulation of TLR5 is accomplished in a protein synthesis-independent manner through mobilization of intracellular receptor pools to the cell surface. Regulation of TLR5 expression on neutrophils. A, Regulation of TLR5 surface expression. Peripheral blood-isolated neutrophils (5 × 106/ml) were incubated in RPMI 1640 medium at 37°C/5% CO2 for 30 min with CF BALF, PMA (10−7 M)/ionomycin (10−5 M), fMLP (1 μM), LTA (10 μg/ml; TLR2), P. aeruginosa LPS (100 ng/ml; TLR4), CpG (100 μg/ml; TLR9), Pam3CSK4 (10 μg/ml; TLR1/2), P. aeruginosa flagellin (1 μg/ml; TLR5), recombinant human IL-8 (72 aa, 50 ng/ml), recombinant human G-CSF (100 ng/ml), recombinant human GM-CSF (100 ng/ml), recombinant human IFN-γ (1000 U/ml), recombinant human TNF-α (50 ng/ml), or the specific CFTR inhibitor GlyH-101 (5 μg/ml). After the incubation period, neutrophils were separated by washing, were stained, and TLR5 expression was quantified by flow cytometry. Bars represent mean ± SEM. MFI (specific Ab staining minus isotype staining). ∗∗, p < 0.01, ∗, p < 0.05 vs medium treatment. B, TLR pathways engaged by Pam3CSK4. Peripheral blood-isolated neutrophils were incubated at 37°C/5% CO2 for 30 min in RPMI 1640 medium alone or with medium plus Pam3CSK4 (10 μg/ml). Where indicated, isolated neutrophils were pretreated for 30 min with anti-TLR1, anti-TLR2, anti-TLR6, a combination of the Abs, or isotype Abs (20 μg/ml) before Pam3CSK4 (10 μg/ml) stimulation. After the incubation period, neutrophils were washed and stained. TLR5 surface expression on neutrophils was quantified by flow cytometry. Bars represent mean ± SEM. MFI (specific Ab staining minus isotype staining).∗, p < 0.05. C, TLR pathways engaged by CF BALF. Peripheral blood-isolated neutrophils were incubated at 37°C/5% CO2 for 30 min in RPMI 1640 medium alone or with pooled CF BALF. Where indicated, isolated neutrophils were pretreated for 30 min with anti-TLR1, anti-TLR2, anti-TLR6, a combination of the Abs, or isotype Abs (20 μg/ml) before CF BALF stimulation. After the incubation period, neutrophils were washed and stained. TLR5 surface expression on neutrophils was quantified by flow cytometry. Bars represent mean ± SEM. MFI (specific Ab staining minus isotype staining).∗, p < 0.05. D, Expression kinetics of TLR5. Peripheral blood-isolated neutrophils (5 × 106/ml) were incubated in RPMI 1640 medium at 37°C/5% CO2 with Pam3CSK4 (10 μg/ml). At the indicated time points, neutrophils were separated by washing, were stained, and surface and intracellular TLR5 expression were quantified by flow cytometry. Where indicated, the neutrophils were pretreated for 2 h on ice with 5 μg/ml CHX and then treated with Pam3CSK4 (10 μg/ml). After the final incubation period, neutrophils were washed, were stained, and TLR5 expression was quantified by flow cytometry. Bars represent mean ± SEM. MFI (specific Ab staining minus isotype staining). E, Receptor distribution of TLR5 using confocal microscopy. Peripheral blood-isolated neutrophils (5 × 106/ml) were incubated in RPMI 1640 medium at 37°C/5% CO2 for 30 min with PMA (10−7 M)/ionomycin (10−5 M), fMLP (1 μM), LTA (10 μg/ml; TLR2), P. aeruginosa LPS (100 ng/ml; TLR4), CpG (100 μg/ml; TLR9), Pam3CSK4 (10 μg/ml; TLR1/2), P. aeruginosa flagellin (1 μg/ml; TLR5), recombinant human IL-8 (72 aa, 50 ng/ml), recombinant human G-CSF (100 ng/ml), recombinant human GM-CSF (100 ng/ml), recombinant human IFN-γ (1000 U/ml), recombinant human TNF-α (50 ng/ml), or the specific CFTR inhibitor GlyH-101 (5 μg/ml). Triton X-100 (0.05% at 4°C)- permeabilized neutrophils were used to visualize TLR5 distribution between surface and intracellular sites. Neutrophils were then stained with rabbit anti-TLR5 Abs, anti-rabbit-Ig Alexa Fluor 555, and Con A conjugated to Alexa Fluor 488. Confocal laser-scanning microscopy was performed with the Leica TCS NT laser system, including a Leica DM IRB microscope. Luminosity analysis was performed using SigmaScan Pro software. ▪, Surface expression; □, intracellular receptor pools; the two dotted lines represent the surface or intracellular fluorescence intensity of medium-treated neutrophils; ∗, p < 0.05 vs medium treatment. Because we found decreased TLR2 surface expression levels on peripheral blood neutrophils in CF patients, we investigated which factors regulate TLR2 expression on neutrophils. TNF-α strongly down-regulated TLR2 surface expression, while PMA/ionomycin, G-CSF, GM-CSF, and Pam3CSK4 up-regulated TLR2 expression (Fig. 3⇓A). CFTR inhibition had no effect on TLR2 expression. Incubation of neutrophils with CF BALF slightly increased TLR2 surface receptor expression. Since increased TNF-α serum levels have been described in CF patients (30, 31, 32), we analyzed whether TNF-α serum levels were associated with reduced TLR2 expression levels on circulating CF neutrophils in CF patients in vivo. We found increased TNF-α serum levels in CF vs bronchiectasis and control subjects (Fig. 3⇓B). TNF-α serum levels showed an inverse correlation with TLR2 surface expression levels on circulating neutrophils (Fig. 3⇓C). When we measured the response of TLR4 surface expression to several proinflammatory cytokines, TLR ligands, and CFTR inhibition, we found that only IFN-γ slightly up-regulated TLR4 expression, but incubation of neutrophils with CF BALF had no significant effect on TLR4 surface receptor expression (Fig. 3⇓D). Regulation of TLR2 and TLR4 surface expression. A, Regulation of TLR2 surface expression. Peripheral blood-isolated neutrophils (5 × 106/ml) were incubated in RPMI 1640 medium at 37°C/5% CO2 for 30 min with CF BALF, PMA (10−7 M)/ionomycin (10−5 M), fMLP (1 μM), LTA (10 μg/ml; TLR2), P. aeruginosa LPS (100 ng/ml; TLR4), CpG (100 μg/ml; TLR9), Pam3CSK4 (10 μg/ml; TLR1/2), P. aeruginosa flagellin (1 μg/ml; TLR5), recombinant human IL-8 (72 aa, 50 ng/ml), recombinant human G-CSF (100 ng/ml), recombinant human GM-CSF (100 ng/ml), recombinant human IFN-γ (1000 U/ml), recombinant human TNF-α (50 ng/ml), or the specific CFTR inhibitor GlyH-101 (5 μg/ml). After the incubation period, neutrophils were separated by washing, were stained, and TLR2 expression was quantified by flow cytometry. Bars represent mean ± SEM. MFI (specific Ab staining minus isotype staining). ∗, p < 0.05 vs medium treatment. B, TNF-α serum levels. TNF-α serum levels were quantitated by sandwich ELISA in healthy controls (Controls), CF patients, and bronchiectasis (BE) patients. The dotted line indicates the detection limit; ∗, p < 0.05. C, TNF-α serum levels and TLR2 surface expression. TNF-α serum levels of healthy controls, CF patients, and bronchiectasis patients are shown in relation to TLR2 surface expression levels on circulating (peripheral blood) neutrophils. D, Regulation of TLR4 surface expression. Peripheral blood-isolated neutrophils (5 × 106/ml) were incubated in RPMI 1640 medium at 37°C/5% CO2 for 30 min with CF BALF, PMA (10−7 M)/ionomycin (10−5 M), fMLP (1 μM), LTA (10 μg/ml; TLR2), P. aeruginosa LPS (100 ng/ml; TLR4), CpG (100 μg/ml; TLR9), Pam3CSK4 (10 μg/ml; TLR1/2), P. aeruginosa flagellin (1 μg/ml; TLR5), recombinant human IL-8 (72 aa, 50 ng/ml), recombinant human G-CSF (100 ng/ml), recombinant human GM-CSF (100 ng/ml), recombinant human IFN-γ (1000 U/ml), recombinant human TNF-α (50 ng/ml), or the specific CFTR inhibitor GlyH-101 (5 μg/ml). After the incubation period, neutrophils were separated by washing, were stained, and TLR4 expression was quantified by flow cytometry. Bars represent mean ± SEM. MFI (specific Ab staining minus isotype staining). ∗, p < 0.05 vs medium treatment. These findings demonstrate that TNF-α down-regulates TLR2 surface expression on neutrophils and that increased serum levels of TNF-α are associated with reduced TLR2 surface expression on circulating neutrophils in CF patients in vivo. Next, we examined whether the activation of TLR5 on neutrophils may affect antibacterial neutrophil function. Activation of TLR5 by flagellin treatment enhanced IL-8 production (Fig. 4⇓A) and phagocytosis of P. aeruginosa by neutrophils (Fig. 4⇓B). Blocking of TLR5 before flagellin treatment abrogated the stimulating effect of flagellin, whereas the isotype control Ab treatment had no effect, suggesting that these effects were mediated via TLR5. 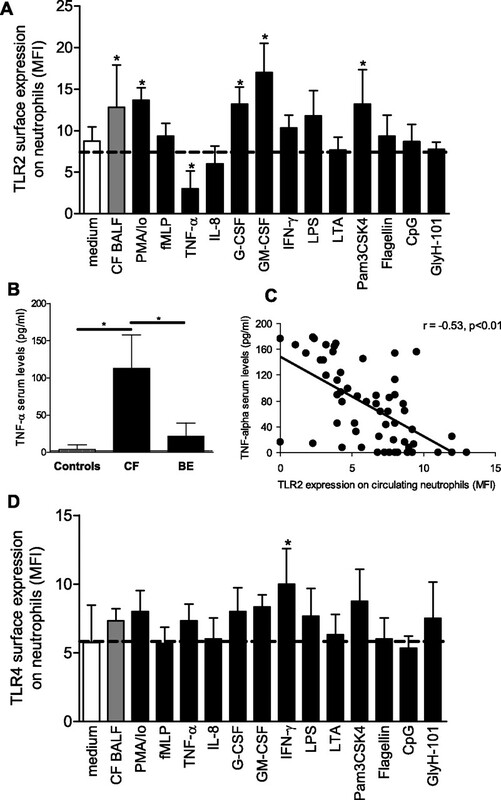 TLR5 activation also enhanced the fMLP-induced respiratory of neutrophils (Fig. 5⇓). Since flagellin treatment induced IL-8 production (Fig. 4⇓A) and IL-8 is a well-known potent stimulator of the respiratory burst via CXCR1 (8), we inhibited IL-8 and/or CXCR1 to analyze whether the effects were mediated indirectly via IL-8/CXCR1. In fact, neutralization of IL-8 or CXCR1, but not CXCR2, abrogated the enhancing effect of flagellin on fMLP-induced respiratory burst (Fig. 4⇓). 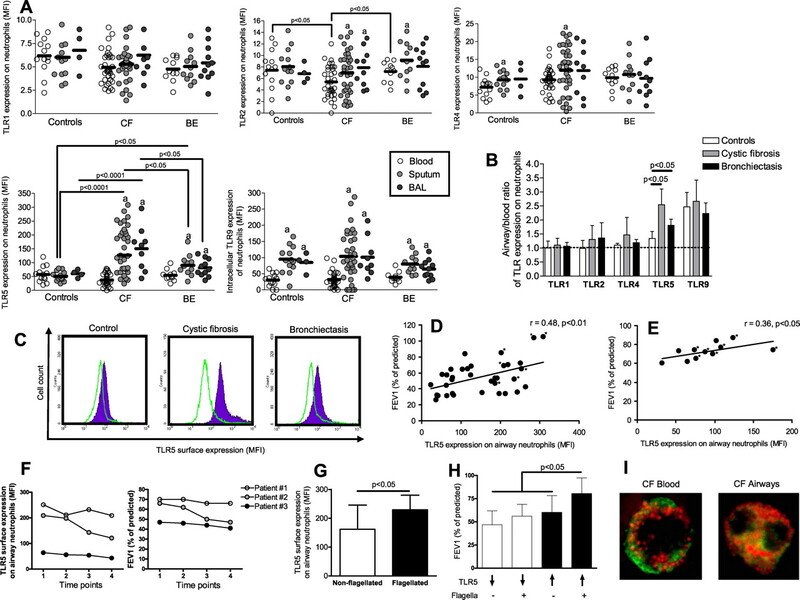 These results demonstrate that TLR5 activation enhances antibacterial neutrophil functions mediated, at least partly, via an induction of IL-8 secretion and CXCR1 signaling in neutrophils. TLR5 activation enhances neutrophil functions. Peripheral blood-isolated neutrophils from healthy control subjects were incubated in RPMI 1640 medium at 37°C/5% CO2 for 1 h without (□) or with flagellin (▪; 10 μg/ml). TLR5 signaling was inhibited by pretreatment of neutrophils for 30 min with anti-TLR5-blocking Abs (20 μg/ml). As control, isotype Abs were used instead of anti-TLR5 Abs (20 μg/ml). ∗, p < 0.05 vs medium treatment (□). A, IL-8 production. After centrifugation, supernatants of the stimulated cells were collected. Levels of IL-8 were quantified in supernatants by ELISA. Bars represent mean ± SEM. Data are representative for five independent experiments. B, Phagocytosis. P. aeruginosa bacteria were incubated with the fluorescent ligand LY for 60 min at room temperature. After preopsonization, the bacteria (2 × 107/ml) in HBSS-gel were incubated at 37°C for 2 h with neutrophils (2 × 106/ml). After the incubation period, the neutrophils were separated from the free bacteria by three centrifugations at 200 × g for 5 min. The LY fluorescence of the isolated neutrophils was analyzed by flow cytometry. Bars represent mean ± SEM. Data are representative for five independent experiments. TLR5 activation enhances respiratory burst via CXCR1 signaling. Isolated peripheral blood neutrophils were incubated at equal numbers (2 × 106/ml) with dihydrorhodamine 123 stain for 20 min at 37°C/5% CO2. We then added fMLP (1 mM) without (□) or with flagellin (▪; 10 μg/ml) to the cells for 30 min at 37°C. The respiratory burst of the neutrophils was analyzed by measuring the rhodamine 123 fluorescence intensity by flow cytometry. Where indicated, neutrophils were pretreated with an IgG isotype control Ab or anti-TLR5-, anti-CXCR1-, or anti-CXCR2-blocking Abs (all 20 μg/ml). Where indicated, free IL-8 was neutralized after fMLP/flagellin stimulation in the conditioned cell supernatant. ∗, p < 0.05. Animal studies point to a crucial role for TLRs in the innate host defense against P. aeruginosa. In this study, we show for the first time that among MyD88-dependent antibacterial TLRs, TLR5 expression is specifically up-regulated on infiltrated airway neutrophils at sites of P. aeruginosa infection in CF and, to a lesser extent, non-CF bronchiectasis lung disease. The correlation of TLR5 surface expression levels on airway neutrophils with lung function values suggests a clinically relevant role for TLR5. Cellular studies demonstrated that TLR5 is stored intracellularly in neutrophils and is mobilized to the cell surface through TLR1 and TLR2 signaling pathways. Activation of TLR5 enhanced IL-8 production, phagocytic capacity, and CXCR1-mediated respiratory burst activity of neutrophils. These findings point to a critical role for TLR5 in neutrophil-P. aeruginosa interactions, with relevance for CF and other P. aeruginosa-associated lung diseases. Despite TLR5 signaling sharing common characteristics with other MyD88-dependent TLRs such as TLR2 and TLR4 (33), there is evidence from murine models for a nonredundant role for TLR5 in P. aeruginosa infection. Jeyaseelan et al. (13) compared the antibacterial host defense against Klebsiella pneumoniae and P. aeruginosa in mice deficient in the Toll/IL-1R domain-containing adaptor protein (TIRAP). TIRAP is an adaptor protein for TLR1, TLR2, TLR4, and TLR6, but not for TLR5 (35). In contrast to K. pneumoniae where TIRAP was essential for bacterial clearance, the absence of TIRAP did not affect the immune response against P. aeruginosa, suggesting a distinct role for TLR5 in anti-P. aeruginosa host defense (36). Recently, the significance of TLR5 signaling in antibacterial host defense was further highlighted in a murine model of acute P. aeruginosa lung disease (17). In this study, the absence of functional flagellin resulted in a suppression of myeloperoxidase activity and decreased levels of the neutrophilic chemokine keratinocyte-derived chemokine (KC, CXCL1) in the lung after P. aeruginosa infection, suggesting that TLR5 signaling modulates neutrophil responses in vivo. These animal studies inspired us to evaluate the expression and functionality of TLR5 on neutrophils at the pulmonary site of P. aeruginosa infection. Our findings confirm and extend these animal studies because we demonstrate that 1) TLR5 activation enhances antibacterial neutrophil functions, 2) TLR5 is specifically up-regulated on airway neutrophils in human CF lung disease, and 3) TLR5 surface expression levels correlate with lung function values in these patients. These ex vivo findings led us to hypothesize that the bacterial airway microenvironment in CF lungs up-regulates TLR5 surface expression on neutrophils. We observed that neutrophils express TLR5 in their cytoplasm, consistent with previous findings in epithelial cells (37) and T cells (38). Since CF and, to a lesser extent, bronchiectasis airway fluids contain high amounts of TLR ligands and proinflammatory cytokines/chemokines, in particular IL-8 and TNF-α (27, 39), we hypothesized that TLR5 surface expression on airway neutrophils is mobilized from intracellular stores in response to these stimuli. Our finding that patients with flagellated bacteria showed higher TLR5 surface expression levels on airway neutrophils suggested that maybe flagellin by itself up-regulates TLR5 expression. However, flagellin had no effect on TLR5 surface expression in any condition tested. Based on our findings that TLR5 activation by flagellin induced IL-8 production by neutrophils and IL-8, in turn, up-regulated TLR5 surface expression, we tempt to speculate that this autocrine IL-8/TLR5 feedback loop might provide an explanation for the increased TLR5 expression in CF patients with intact flagella. The TLR2 ligands Pam3CSK4 and LTA and, to a lesser extent the CF-associated proinflammatory cytokines (27) IL-8, TNF-α, and G-CSF up-regulated TLR5 expression and neutrophils in a protein synthesis-independent manner. Pam3CSK4, which had the strongest effect on TLR5 up-regulation, is considered as a TLR1/TLR2 ligand, acting via heterodimerization of TLR2 and TLR1 (28, 29). To assess which TLR(s) are responsible for the Pam3CSK4-induced effect, we blocked TLR1, TLR2, and/or TLR6 receptors before Pam3CSK4 stimulation. These studies demonstrated that TLR2 in cooperation with TLR1, but not with TLR6, mediated the Pam3CSK4-induced up-regulation of TLR5 expression. Both TLR2 ligands and proinflammatory cytokines are abundantly present in the pulmonary CF microenvironment (3, 27). To mimic the situation in vivo, we incubated isolated neutrophils with pooled BALF from CF patients and analyzed the effects on TLR expression. CF BALF strongly up-regulated TLR5 expression which was again mediated via TLR1/TLR2 signaling. When viewed in combination, these findings demonstrate that TLR1/TLR2-mediated pathways trigger the up-regulation of TLR5 surface expression on neutrophils and suggest that this mechanism is operative in CF airways in vivo. Our study demonstrates an up-regulation of TLR5 expression on infiltrated neutrophils in two chronic human lung diseases characterized by chronic infection with P. aeruginosa, CF and bronchiectasis. These effects were lung specific, since TLR5 on neutrophils was equally expressed in peripheral blood of CF, bronchiectasis, and healthy control subjects. A major influence of the CFTR mutation on TLR5 expression seems not very probable because 1) TLR5 was equally expressed on circulating neutrophils in healthy controls and CF patients; 2) non-CF bronchiectasis patients had also, but to a minor extent, increased TLR5 surface expression levels on their airway neutrophils; and 3) pharmacological CFTR inhibition in neutrophils in vitro had no effect on TLR5 expression. Based on these findings, we speculate that up-regulation of TLR5 expression on airway neutrophils does not represent a phenomenon primarily due to the inherited defect in the CFTR protein, but is more likely to occur in general in lung diseases with bacterial colonization and sustained neutrophil accumulation, such as bronchiectasis, chronic obstructive pulmonary disease, or panbronchiolitis. The higher TLR5 expression on CF vs bronchiectasis airway neutrophils may be explained by the notion that the airway inflammation in CF is considered to be much more pronounced and that bacterial TLR ligands are present at higher concentrations compared with bronchiectasis lung disease (40). Based on this concept, we speculate that the severity of airway inflammation and/or the amount of TLR1/TLR2 ligands present might determine the extent of TLR5 up-regulation on airway neutrophils. Nevertheless, a neutrophil-intrinsic CFTR-dependent contribution to our findings cannot be definitely excluded based on our data. Since airway neutrophils in CF airways encompass a higher proportion of apoptotic cells (41), apoptosis by itself may induce TLR5 surface expression. An influence of apoptosis on our results, however, seems unlikely because we restricted our flow cytometric analysis to viable neutrophils. During the preparation of this manuscript, a study was published analyzing TLR2 and TLR4 surface expression on circulating and induced sputum neutrophils in CF patients and healthy controls (42). In line with our study, a decreased TLR2 expression was found on circulating neutrophils in CF patients compared with healthy controls. We performed further in vitro experiments to investigate the underlying reason for this observation and found that TLR2 expression on neutrophils was strongly down-regulated by exogenous TNF-α, which is in line with previous findings on TLR2 regulation (43), whereas other cytokines, TLR ligands, or CFTR inhibition could not explain this observation. Correlation analyses in our patients showed an inverse association between serum levels of TNF-α and TLR2 surface expression on circulating neutrophils. Based on these findings, we speculate that increased TNF-α serum levels in CF patients (30, 31, 32, 44) might be responsible for the reduced expression of TLR2 found on circulating CF neutrophils. We included bronchiectasis patients as the non-CF disease group with P. aeruginosa infection and neutrophilic airway inflammation as well as healthy control subjects and analyzed both sputum and BALF cells. In line with the above-mentioned study (42), we found increased TLR4 surface expression on CF airway compared with CF peripheral blood neutrophils. However, when comparing circulating and airway neutrophils from CF patients with cells from bronchiectasis and healthy control subjects, TLR4 expression did not differ significantly among these groups, rendering a CF-specific up-regulation of TLR4 on neutrophils unlikely. In line with previous studies (9, 45, 46), our in vitro experiments showed that TLR2 ligands or proinflammatory cytokines had no or only a slight effect on TLR4 surface expression on isolated neutrophils, especially compared with the strong effect of these reagents on TLR5 expression. Only IFN-γ increased TLR4 expression on neutrophils, but because we found previously that concentrations of IFN-γ in BALF are low in P. aeruginosa-infected CF patients (47) this cytokine may not affect TLR4 expression substantially in vivo. 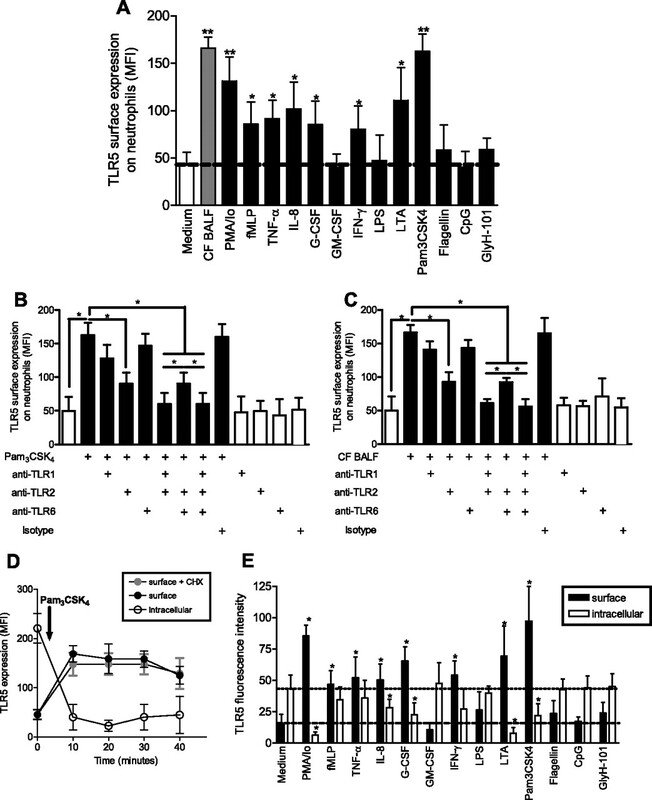 Based on these data, we conclude that the proinflammatory microenvironment in CF airways differentially modulates TLR2 expression on neutrophils: TLR5 is highly susceptible toward receptor up-regulation via a TLR1/2-mediated pathway, whereas TLR2 or TLR4 are only moderately increased or even decreased under these conditions. We found recently that cleavage of CXCR1 on neutrophils impairs bacterial killing (21). This mechanism is of critical relevance in CF airways where high levels of IL-8 are found (27, 47). IL-8 stimulates the respiratory burst and α-defensin release in neutrophils via CXCR1, thereby promoting bacterial killing. In this study, we demonstrate that TLR5 is also involved in antibacterial host defense since TLR5 activation by flagellin stimulated phagocytosis and IL-8 release by neutrophils. Hayashi et al. 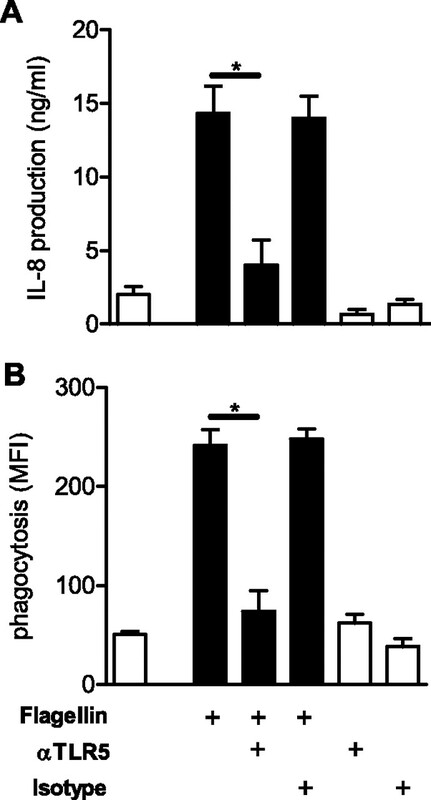 (8) also reported previously that flagellin increased IL-8 production, phagocytosis as well as fMLP-stimulated respiratory burst in isolated neutrophils. Our results are consistent with the latter study except for the finding that the flagellin-induced enhancement of the respiratory burst was abolished when IL-8 was neutralized in flagellin-treated, conditioned neutrophil supernatants or when CXCR1 surface receptors were blocked on neutrophils before flagellin treatment. These results suggest that flagellin has no direct effect on the respiratory burst but mediates this effect via IL-8/CXCR1. Based on these findings, we speculate that TLR5 and CXCR1 signaling cooperate synergistically in augmenting antibacterial neutrophil responses. TLR5 activation increases IL-8 production by neutrophils. IL-8 acts in an autocrine manner to 1) stimulate the respiratory burst via CXCR1 and 2) augment TLR5-dependent pathways via up-regulation of TLR5 surface expression, resulting in a positive feedback loop between TLR5 activation and IL-8/CXCR1 functions. The cleavage of CXCR1 by unopposed proteolytic activity in CF airway fluids, however, prevents the IL-8-mediated enhancement of the respiratory burst in neutrophils, thereby impairing bacterial killing in CF airways in vivo. There is evidence that P. aeruginosa bacteria in chronic CF infection are frequently lacking functional flagella due to transcriptional repression of fliC (encoding flagellin) (48), mediated through the alternative σ factor FliA (49) or due to proteolytic cleavage (50). Consistent with these concepts, the majority of our CF patients had nonflagellated P. aeruginosa bacteria. Given our present study and previous reports, we propose the following scenario of TLR5 involvement in CF lung disease. During early infection, P. aeruginosa encounters the epithelial barrier and triggers the release of chemokines, thereby recruiting neutrophils into the airways (51, 52). Triggered by the airway microenvironment, containing TLR1/TLR2 ligands and proinflammatory cytokines, airway neutrophils mobilize TLR5 surface expression from intracellular pools, enabling efficient recognition of bacterial flagella. Binding of P. aeruginosa flagella to TLR5 stimulates phagocytosis and activates, via an induction of IL-8 production and concomitant CXCR1 activation, the respiratory burst in airway neutrophils. The up-regulated TLR5 expression on CF airway neutrophils has in theory the potential to augment CXCR1-dependent pathways and to enhance antibacterial host defense. However, an efficient antibacterial neutrophil response is precluded for the following reasons: 1) due to cleavage of CXCR1 in CF lung disease (21), IL-8-mediated neutrophil functions are disabled and 2) due to a loss of flagellin in CF lung disease, resulting in “masking” of P. aeruginosa bacteria for recognition by TLR5 and finally leading to a TLR5high/flagellinlow ligand/receptor mismatch, efficient flagella-TLR5 interactions are impaired. Our observation that CF patients with both a high TLR5 surface expression on airway neutrophils and flagellated P. aeruginosa bacteria were the patients with the best-preserved lung function values among all included CF patients favors this scenario and suggests that intact flagella-TLR5 interactions may have a beneficial effect on the outcome of CF lung disease. Further evidence that intact TLR5-flagella interactions are essential for pulmonary antibacterial host defense comes from studies of individuals with a polymorphism in the ligand-binding domain of TLR5 which abrogates flagellin signaling (53). These individuals show an increased susceptibility to pneumonia due to Legionella pneumophila, which shares common characteristics with P. aeruginosa (flagellated, Gram-negative, biofilm formation, ubiquitous aquatic organism). In conclusion, this study demonstrates that TLR5 is up-regulated on airway neutrophils at the pulmonary site of infection, probably mediated via TLR1/TLR2 ligand-induced receptor mobilization from intracellular compartments and suggests TLR5 as a critical component in neutrophil-P. aeruginosa interactions in CF lung disease. Beyond CF lung disease, these findings might have broader implications for chronic lung diseases because an up-regulation of TLR5 surface expression was also found, but to a lesser degree, on airway neutrophils from patients with non-CF bronchiectasis lung disease. Thus, it will be interesting to see whether in other non-CF neutrophilic lung diseases such as chronic obstructive pulmonary disease or neutrophilic asthma similar TLR alterations can be found. We thank Stefanie Gruschka and Andrea Schams, Pediatric Pneumology (University of Munich, Munich, Germany) for technical assistance. We thank Dirk Weissmann, Nicolas Sierig, and Thomas Wudi for critical revisions of this manuscript and helpful discussions. This manuscript contains parts of the thesis of M.S. ↵1 This work was supported by the Society for Pediatric Pneumology (to D.H.) and the Cystic Fibrosis Foundation (Grant GAGGA07A0 to A.G.). ↵3 Abbreviations used in this paper: CF, cystic fibrosis; BAL, bronchoalveolar lavage; BALF, BAL fluid; CHX, cycloheximide; FEV1, forced expiratory volume in 1 s; LTA, lipoteichoic acid; MFI, mean fluorescence intensity; Pam3CSK4 tripalmitoyl, CysSerLys4; PI, propidium iodide; LY, lucifer yellow; TIRAP, Toll/IL-1R domain-containing adaptor protein. Konstan, M. W., M. Berger. 1997. Current understanding of the inflammatory process in cystic fibrosis: onset and etiology. Pediatr. Pulmonol. 24: 137-142. Konstan, M. W., K. A. Hilliard, T. M. Norvell, M. Berger. 1994. Bronchoalveolar lavage findings in cystic fibrosis patients with stable, clinically mild lung disease suggest ongoing infection and inflammation. Am. J. Respir. Crit. Care Med. 150: 448-454. Davis, P. B., M. Drumm, M. W. Konstan. 1996. Cystic fibrosis. Am. J. Respir. Crit. Care Med. 154: 1229-1256. Berger, M.. 2002. Inflammatory mediators in cystic fibrosis lung disease. Allergy Asthma Proc. 23: 19-25. Wine, J. J.. 1999. The genesis of cystic fibrosis lung disease. J. Clin. Invest. 103: 309-312. Roos, D., C. C. Winterbourn. 2002. Immunology: lethal weapons. Science 296: 669-671. Kaisho, T., S. Akira. 2006. Toll-like receptor function and signaling. J. Allergy Clin. Immunol. 117: 979-987. Hayashi, F., T. K. Means, A. D. Luster. 2003. Toll-like receptors stimulate human neutrophil function. Blood 102: 2660-2669. Jeyaseelan, S., S. K. Young, M. Yamamoto, P. G. Arndt, S. Akira, J. K. Kolls, G. S. Worthen. 2006. Toll/IL-1R domain-containing adaptor protein (TIRAP) is a critical mediator of antibacterial defense in the lung against Klebsiella pneumoniae but not Pseudomonas aeruginosa. J. Immunol. 177: 538-547. Luzar, M. A., M. J. Thomassen, T. C. Montie. 1985. Flagella and motility alterations in Pseudomonas aeruginosa strains from patients with cystic fibrosis: relationship to patient clinical condition. Infect. Immun. 50: 577-582. Griese, M., J. Ramakers, A. Krasselt, V. Starosta, S. Van Koningsbruggen, R. Fischer, F. Ratjen, B. Mullinger, R. M. Huber, K. Maier, et al 2004. Improvement of alveolar glutathione and lung function but not oxidative state in cystic fibrosis. Am. J. Respir. Crit. Care Med. 169: 822-828. Griese, M., P. Latzin, M. Kappler, K. Weckerle, T. Heinzlmaier, T. Bernhardt, D. Hartl. 2007. α1-Antitrypsin inhalation reduces airway inflammation in cystic fibrosis patients. Eur. Respir. J. 29: 240-250. Hartl, D., P. Latzin, P. Hordijk, V. Marcos, C. Rudolph, M. Woischnik, S. Krauss-Etschmann, B. Koller, D. Reinhardt, A. A. Roscher, et al 2007. Cleavage of CXCR1 on neutrophils disables bacterial killing in cystic fibrosis lung disease. Nat. Med. 13: 1423-1430. Kunzelmann, K., K. Scheidt, B. Scharf, J. Ousingsawat, R. Schreiber, B. Wainwright, B. McMorran. 2006. Flagellin of Pseudomonas aeruginosa inhibits Na+ transport in airway epithelia. FASEB J. 20: 545-546. Muanprasat, C., N. D. Sonawane, D. Salinas, A. Taddei, L. J. Galietta, A. S. Verkman. 2004. Discovery of glycine hydrazide pore-occluding CFTR inhibitors: mechanism, structure-activity analysis, and in vivo efficacy. J. Gen. Physiol. 124: 125-137. Du, J. W., F. Zhang, J. E. Capo-Aponte, S. D. Tachado, J. Zhang, F. S. Yu, R. A. Sack, H. Koziel, P. S. Reinach. 2006. AsialoGM1-mediated IL-8 release by human corneal epithelial cells requires coexpression of TLR5. Invest. Ophthalmol. Vis. Sci. 47: 4810-4818.
vanPelt, L. J., R. van Zwieten, R. S. Weening, D. Roos, A. J. Verhoeven, B. G. J. M. Bolscher. 1996. Limitations on the use of dihydrorhodamine 123 for flow cytometric analysis of the neutrophil respiratory burst. J. Immunol. Methods 191: 187-196. Motulsky, H.. 1995. Intuitive Biostatistics Oxford Univ. Press, New York. Bonfield, T. L., J. R. Panuska, M. W. Konstan, K. A. Hilliard, J. B. Hilliard, H. Ghnaim, M. Berger. 1995. Inflammatory cytokines in cystic-fibrosis lungs. Am. J. Respir. Crit. Care Med. 152: 2111-2118. Ozinsky, A., K. D. Smith, D. Hume, D. M. Underhill. 2000. Co-operative induction of pro-inflammatory signaling by Toll-like receptors. J. Endotoxin. Res. 6: 393-396. Elborn, J. S., S. M. Cordon, P. J. Western, I. A. Macdonald, D. J. Shale. 1993. Tumour necrosis factor-α, resting energy expenditure and cachexia in cystic fibrosis. Clin. Sci. 85: 563-568. Norman, D., J. S. Elborn, S. M. Cordon, R. J. Rayner, M. S. Wiseman, E. J. Hiller, D. J. Shale. 1991. Plasma tumour necrosis factor α in cystic fibrosis. Thorax 46: 91-95. Suter, S., U. B. Schaad, P. Roux-Lombard, E. Girardin, G. Grau, J. M. Dayer. 1989. Relation between tumor necrosis factor-α and granulocyte elastase-α1-proteinase inhibitor complexes in the plasma of patients with cystic fibrosis. Am. Rev. Respir. Dis. 140: 1640-1644. Janssens, S., R. Beyaert. 2003. Role of Toll-like receptors in pathogen recognition. Clin. Microbiol. Rev. 16: 637-646. Ueta, M., T. Nochi, M. H. Jang, E. J. Park, O. Igarashi, A. Hino, S. Kawasaki, T. Shikina, T. Hiroi, S. Kinoshita, H. Kiyono. 2004. Intracellularly expressed TLR2s and TLR4s contribution to an immunosilent environment at the ocular mucosal epithelium. J. Immunol. 173: 3337-3347. Crellin, N. K., R. V. Garcia, O. Hadisfar, S. E. Allan, T. S. Steiner, M. K. Levings. 2005. Human CD4+ T cells express TLR5 and its ligand flagellin enhances the suppressive capacity and expression of FOXP3 in CD4+CD25+ T regulatory cells. J. Immunol. 175: 8051-8059. Angrill, J., C. Agusti, R. De Celis, X. Filella, A. Rano, M. Elena, J. P. De La Bellacasa, A. Xaubet, A. Torres. 2001. Bronchial inflammation and colonization in patients with clinically stable bronchiectasis. Am. J. Respir. Crit. Care Med. 164: 1628-1632. Berger, M.. 1991. Inflammation in the lung in cystic-fibrosis: a vicious cycle that does more harm than good. Clin. Rev. Allergy 9: 119-142. Watt, A. P., J. Courtney, J. Moore, M. Ennis, J. S. Elborn. 2005. Neutrophil cell death, activation, and bacterial infection in cystic fibrosis. Thorax 60: 659-664. Petit-Bertron, A. F., O. Tabary, H. Corvol, J. Jacquot, A. Clement, J. M. Cavaillon, M. Adib-Conquy. 2008. Circulating and airway neutrophils in cystic fibrosis display different TLR expression and responsiveness to interleukin-10. Cytokine 41: 54-60. Flo, T. H., O. Halaas, S. Torp, L. Ryan, E. Lien, B. Dybdahl, A. Sundan, T. Espevik. 2001. Differential expression of Toll-like receptor 2 in human cells. J. Leukocyte Biol. 69: 474-481. Shmarina, G. V., A. L. Pukhalsky, S. N. Kokarovtseva, D. A. Pukhalskaya, L. A. Shabalova, N. I. Kapranov, N. J. Kashirskaja. 2001. Tumor necrosis factor-α/interleukin-10 balance in normal and cystic fibrosis children. Mediat. Inflamm. 10: 191-197. Parker, L. C., M. K. Whyte, S. K. Dower, I. Sabroe. 2005. The expression and roles of Toll-like receptors in the biology of the human neutrophil. J. Leukocyte Biol. 77: 886-892. Sabroe, I., E. C. Jones, L. R. Usher, M. K. Whyte, S. K. Dower. 2002. Toll-like receptor (TLR) 2 and TLR4 in human peripheral blood granulocytes: a critical role for monocytes in leukocyte lipopolysaccharide responses. J. Immunol. 168: 4701-4710. Hartl, D., M. Griese, M. Kappler, G. Zissel, D. Reinhardt, C. Rebhan, D. J. Schendel, S. Krauss-Etschmann. 2006. Pulmonary TH2 response in Pseudomonas aeruginosa-infected patients with cystic fibrosis. J. Allergy Clin. Immunol. 117: 204-211. Lopez-Boado, Y. S., M. Espinola, S. Bahr, A. Belaaouaj. 2004. Neutrophil serine proteinases cleave bacterial flagellin, abrogating its host response-inducing activity. J. Immunol. 172: 509-515. Armstrong, D. S., K. Grimwood, J. B. Carlin, R. Carzino, J. P. Gutierrez, J. Hull, A. Olinsky, E. M. Phelan, C. F. Robertson, P. D. Phelan. 1997. Lower airway inflammation in infants and young children with cystic fibrosis. Am. J. Respir. Crit Care Med. 156: 1197-1204. Khan, T. Z., J. S. Wagener, T. Bost, J. Martinez, F. J. Accurso, D. W. H. Riches. 1995. Early pulmonary inflammation in infants with cystic-fibrosis. Am. J. Respir. Crit. Care Med. 151: 1075-1082.